Mary Frey is a prominent photographer and Professor of Photography at Hartford Art School, Connecticut, USA. I first came across her work in the catalogue of Pleasures and Terrors of Domestic Comfort, the influential MoMA exhibition of 1991, so I was particularly excited when she agreed to be interviewed here. 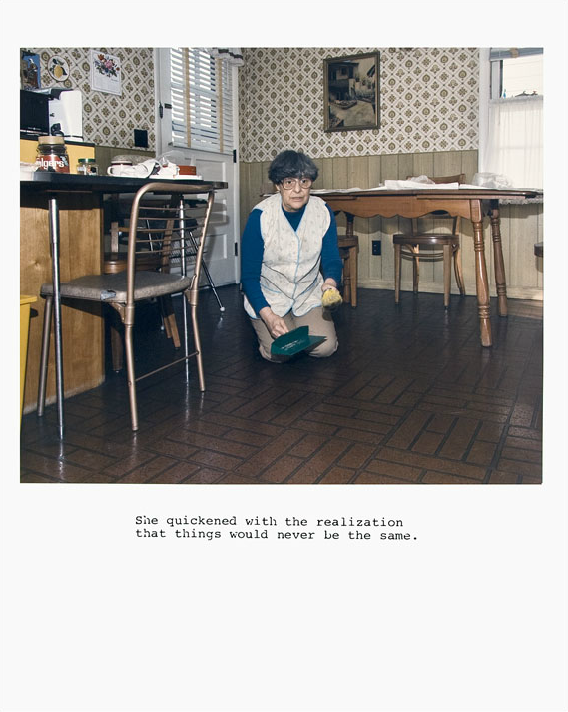 Her work demonstrates a sharpness of eye and meticulous technique and her concepts, although seemingly banal, renew my faith in everyday wonder and photography’s ability to take those moments and immortalise them. For me, it was a pleasure to discover her continued devotion to photography and her considered approach. I’ll let you enjoy it for yourself. Can you tell us about when you first discovered photography? As a child, I loved to paint and draw and excelled in my art classes. In addition I grew up close to NYC, so occasionally visited museums to see original works of art. I always owned a point and shoot camera which I used to record special events, but never really thought about photography as a serious art practice until I was in college. I still remember that “aha” moment. It occurred during my third year of study as an art student. I came across Henri Cartier-Bresson’s book, The Decisive Moment, and I was hooked- I needed to make photographs. That was in 1969, and I never looked back. Did you know early on that it was going to be a life pursuit? Upon graduation I had a brief stint studying photography in graduate school but dropped out because I felt my work lacked direction and I was not ready to make a serious commitment to the practice. For the next seven years I held a variety of jobs (editorial, sales, teaching, commercial) all connected to photography, while continuing to make and exhibit my personal work. At the time I was doing street photography, strongly influenced by the work of Robert Frank, Gary Winogrand and Diane Arbus. I found teaching to be a good fit with these artistic activities so returned to graduate school in 1977 with a new commitment to photography as a lifetime vocation. Some of your early practice (Domestic Rituals and Real Life Dramas) is concerned with exploring photography’s role in depicting the everyday. What began your interest in these themes and what did you find? During my second year of graduate study I visited my parents and dug out our family albums. At the time I was struck by how many of my childhood memories were formed by the snapshots taken during these events. Although not an original insight, it acted as a catalyst to explore this idea. I began by recreating either the scenes I remembered or the spirit of these events, using family and friends as actors. I also drew inspiration from sixties television, the illustrations in the popular magazines like Life and Look that I grew up with, and the writing of novelists like John Cheever, Raymond Carver and Jayne Ann Phillips. As the project evolved, I made a “laundry list” of everyday moments to photograph. I sought out people in the street whom I found visually interesting and managed to get into their homes to document these activities. All these folks (family members and strangers) became my cast of characters for both the Domestic Rituals and Real Life Dramas series, which I worked on for the next eight years. How was it received at the time? What else was going on in photography then that stands out to you? Domestic Rituals was generally well received. 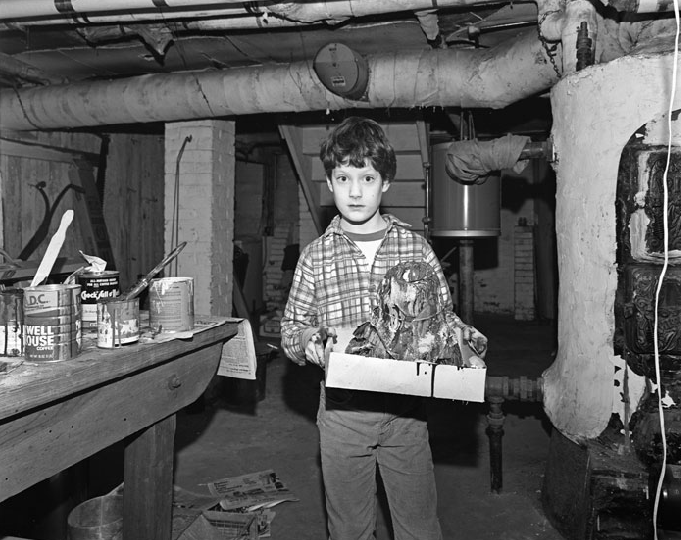 I had several solo shows around the US, and received a Guggenheim Fellowship for the work in 1984. Real Life Dramas was featured in “New Photography 2” at the Museum of Modern Art (NY) in 1986. During this time there was a lot of street photography going on. Also artists were using large format cameras in many non-traditional situations- and I was looking at the early work of my contemporaries like Nick Nixon, Emmet Gowin, Sally Mann and Joel Meyerowitz, and artists who explored American vernacular themes in their work such as William Eggleston and Stephen Shore. In addition, having studied in the MFA program at Yale, the influence of Walker Evans was profound. The prosaic nature of many of your scenes interests me. I particularly enjoy the attention to the aesthetic of the image that your work demonstrates in a constructed way, yet still retaining a sense of documentary. Can you talk us through your creative process? How do you find pictures? Or do you create them? The tools I employed- a large format camera, B&W film, flashbulb lighting- had a significant affect on how my images looked, and in turn, how my aesthetic evolved. Working slowly with the view camera forced me to construct, rather than capture moments. My diffuse lighting techniques created a soft, revealing and democratic light, where everything was described with precision and all things in a scene had equal visual weight. When I approached potential subjects I simply stated I wanted to photograph everyday people doing everyday things. My working process was fluid. Often I had specific ideas about what I wanted for the photograph, but occasionally I would see a gesture in passing that intrigued me, and asked my subject to re-create it for the camera. The successful images hovered somewhere between the documentary and directorial modes, evoking the look of film stills or tableaux-vivants. 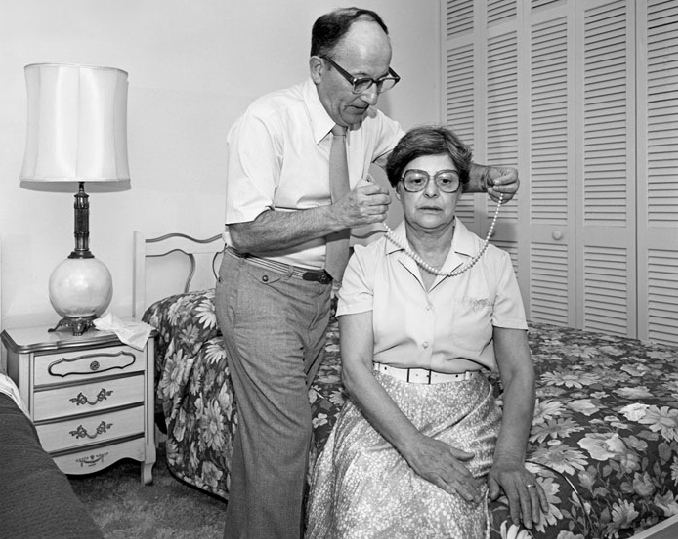 Perhaps photography works best in these scenarios; making something rather mundane into a universally resonant moment. I think it is a talent to resist the sensational in photography to concentrate on the ‘unseen’. Could you talk about your experience of / thoughts on this a little? A photograph shows us what we know, yet contains its own fiction. That’s what excited me about Bresson’s work many years ago and the work of others whom I admire. I’ve always found it a challenge to photograph the familiar and to move beyond the image of what it is – to what it could be about. What techniques do you use and how do you decide for each project what suits it? I truly believe that work begets work and materials hold meaning. I often start with a simple idea and allow the photographs to inform the process to move the project along. For example, I spent over a year photographing taxidermy under studio lights with a digital camera for the Imagining Fauna series. Although lush and beautiful, these images lacked an integrity I couldn’t pin down. Then I happened upon an ambrotype and I realized this is what they needed to be. I converted the digital files into B&W transparencies and, with the wet-plate process, printed them onto black glass. 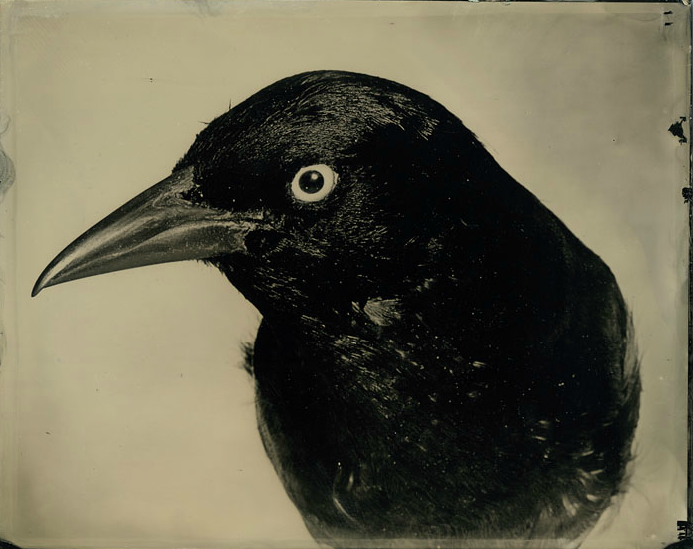 Not only were these images of 19th century specimens created with an antique photo process, but the plates themselves had a physicality that acted as metaphor for the subjects and, in turn, our precarious relationship with nature. In Real Life Dramas you introduce text as a major component of the ‘image’. What were your reasons for this and how do you see image and text working together here? Where did the texts come from? When I began Real Life Dramas I merely wanted to see what my pictures could mean in color. I approached my subjects in a similar way to the earlier B&W work, but switched to a medium format camera. This allowed me to shoot off-tripod changing the look and feel of the images. While working in people’s homes during the day, I noticed that their television sets were always on, often tuned to soap operas. Thinking about how popular culture permeates (mediates) our lives, I began to wonder how words could affect the meaning of my images. I read mass-market paperback novels, and appropriated the feel of their language creating phrases I would pair with the photographs. Often overblown and pretentious, these words would shift and/or change the reading of the photographs, injecting humor into sober moments. 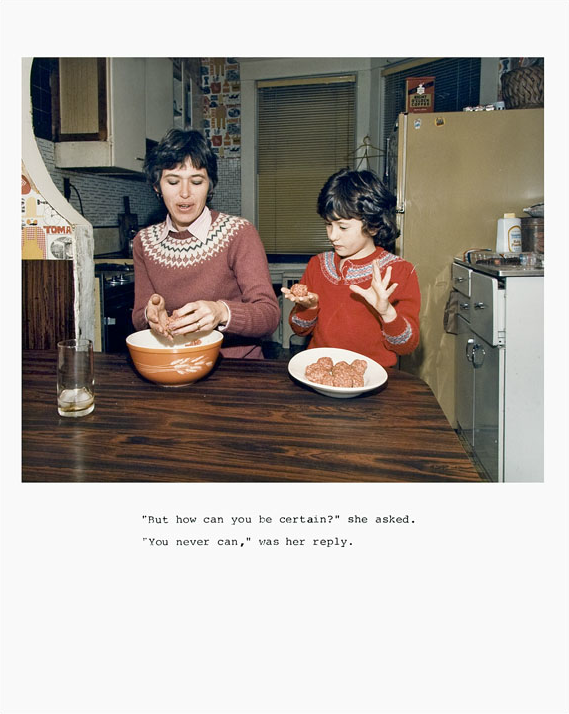 The text looks like a caption, but operates against the description of the scene depicted, opening up possibilities for new interpretations and bringing into question the “truth” of the photographic image. You are now working on Imagining Fauna. What brought you to this seemingly new subject territory? I read an article entitled “Dying a Second Death” about how 19th Century taxidermy was deteriorating due in part to the chemicals used to preserve them, as well as the expense required to restore and house them in museums worldwide. This struck a nerve with me and my instincts took over. As I mentioned above, I spent a year photographing these creatures without a clear notion of why. It wasn’t until I discovered the wet-plate collodion process that it all made sense. What have you learnt about yourself as a result of pursuing photography for the bulk of your career? I’ve learned to trust my instincts. I’m unafraid of hard work, and willing to accept failure. What keeps you going as a practitioner? I’ve made a commitment to my practice and I feel a responsibility to my work. It has been recognized and supported these many years and I appreciate and respect that. What advice would you give early career photographers? Be patient, work hard, follow your passions, take chances and don’t be afraid to fail. Check out my sister all freshly pressed!!! I love these photographs. Finding art in the ordinary …wonderful. Very creative, informative, and inspirational… loved the real life pictures! I love the exposure in your photographs! I love these too.I make a confession that is,that I have always been obsessed with the irrelavant. Nice interview, I find your site in general a refreshing read. Nice! This has sparked ideas of my own.